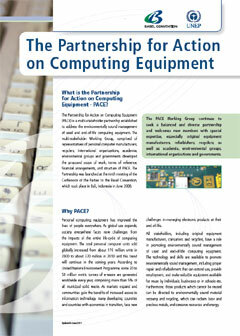 The PACE Guidance Document is to provide guidance on the environmentally sound management of used and end-of-life computing equipment. It emphasizes reuse and recycling, with the aim of avoiding the final disposal of such used and end-of life products in final-disposal facilities such as landfills or incinerators. The document complements the guidelines prepared by various Project Groups and summarizes the information provided in the report prepared by the ad interim project group on environmentally sound management criteria recommendations, and guidelines prepared by project groups 1.1 (environmentally sound testing, refurbishment and repair of used computing equipment) and 2.1 (environmentally sound material recovery and recycling of end-of-life computing equipment). By decision BC-11/15, the Conference of the Parties to the Basel Convention adopted sections 1, 2, 4 and 5 of the guidance document. By decision BC-13/12, the thirteenth meeting of the Conference of the Parties adopted, on an interim basis, section 3 of the guidance document and the proposed additional changes to ensure consistency of the text throughout the guidance document. Annex I to the document UNEP/CHW.13/INF/31/Rev.1 sets out the final version of the guidance document as adopted, on an interim basis, by the Conference of the Parties to the Basel Convention in 2017.